This 90-page eBook provides a comprehensive guide on how to successfully lead early stage deals. You'll also find an Appendix full of templates and checklists to use in your own deal lead process. 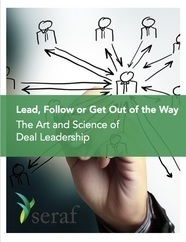 Interested in purchasing a hard copy version of Lead, Follow or Get Out of the Way? Buy it now at Amazon.com.